Notre Dame de Paris (French for "Our Lady of Paris"), usually known as Notre Dame Cathedral, is a historic Catholic cathedral in Paris, France. The cathedral is located on the eastern half of Île de la Cité, one of two remaining natural islands on the River Seine in Paris. It is known the site contained a previous church, Saint Étienne (St Stephen's) since the 4th century, but it was demolished in 1160, and construction of Notre Dame began in 1163. 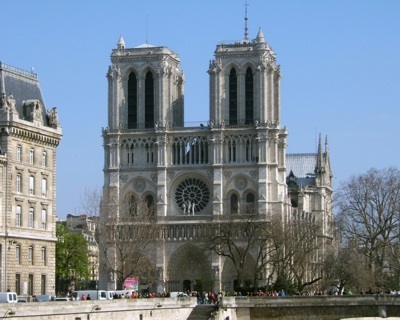 Throughout its history, Notre Dame Cathedral has undergone various alterations, as well as suffering from vandalism (from Huguenot riots in 1548, and during the French Revolution), and war damage during World War II. A major maintenance and restoration program has been ongoing since 1991. The cathedral is still a working cathedral to this day, and is the cathedral of the Archdiocese of Paris, as well as being the official chair of the Archbishop of Paris. The cathedral's treasury contains a reliquary which contains some of Catholicism's most important first-class relics, including the Crown of Thorns, a fragment of the True Cross, and one of the Holy Nails.